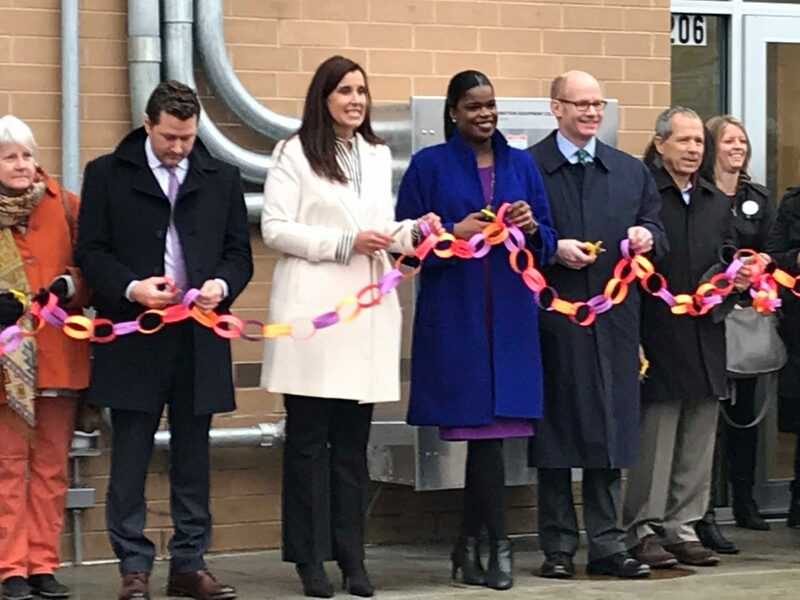 Cutting the ribbon at last week's official opening of New Mom's facility in Oak Park was (from left to right) New Moms President and CEO Laura Zumdahl, Cook County State's Attorney Kim Foxx, state Sen. Don Harmon and Oak Park Mayor Anan Abu-Taleb. New Moms celebrated the grand opening of its new facility in Oak Park last week after years of planning. “This is deeply personal to me,” Cook County State’s Attorney Kim Foxx said at the March 15th event. “I tell everyone, everywhere I go that I am the child of a teenage mom, second of two children she had at 18. Located at 206 Chicago Ave., the 21,700-square-foot building features 18 one- and two- bedroom apartments, as well as program space for the organization’s family support services. That’s critical because every mom coming through the program is either currently homeless or been homeless in the past. The facility offers permanent housing to young mothers; that differs from the New Mom’s main facility located nearby at 5317 W. Chicago Ave., where mothers can stay no more than two years. While the housing situation may be different, the goal — to help mothers become self-sufficient through job training and family support — remains the same. The acquisition of the Oak Park organization Parenthesis Family Center enabled New Moms to expand its family support services to the near western suburbs. This has resulted in nearly doubling the number of families served, said Jenna Hania, director of development and communications for New Moms. Mothers can receive the same services offered in the city without having to jump the city/ suburban line and potentially lose these services. For example, homeless suburban women do not have access to Chicago’s Coordinated Entry System, which helps connect the homeless in Chicago to housing programs. New Moms is working with the Regional Housing Initiative and the State Referral Network, which provide lists of people who are homeless and waiting for housing. This allows New Moms to find qualified families who will be arriving from throughout the Chicago area. Businesses that New Moms launched from Austin to employ the mothers, such as the candle making company Bright Endeavors, will continue at the Oak Park center to help moms transition to the professional world. Funding for the New Moms Oak Park facility came from the Illinois Housing Development Authority, which helps to fund affordable housing, as well as from a capital campaign. The total price for the project was $7.25 million. The Austin African American Business Networking Association is sponsoring the event, which will be held from 6 to 10 p.m. Dec. 28th at Malcolm X College, 1900 W. Jackson Blvd. Cook County State's Attorney Kim Foxx will be the keynote speaker, and Chicago Sun-Times columnist Maudlyne Ihejirika will MC. Tickets are $40. The movie will be screened May 29 at Austin Town Hall, followed by a discussion. The event, which includes dinner and a speaker, will be held Thursday, June 29 from 5 to 7 p.m. at New Moms, 5317 W. Chicago Ave.